It’s February and Valentine's Day is right around the corner! Did you know that Valentine's Day is the 2nd most popular day for wedding engagements? Second only to Christmas. While there may be no diamond rings here, we do have a gem of an update that will help your overall daily engagement with Realeflow. We’re proud to announce the first update in our effort to add analytics and insight to how your Realeflow account is performing. This will help you to make crucial adjustments to your marketing and ensure that you're getting the most out of Realeflow. The first thing you’ll notice is the graph for the last 30 days. This will show you the deliverability of your campaign including the number sent, opened, and clicked in that time period. Hover your mouse over the different colors to view the totals on the graph. 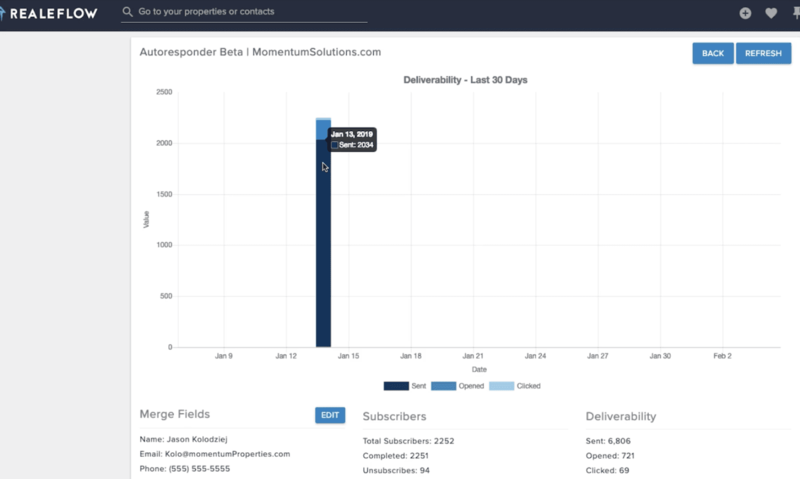 Below the graph, you will see your Subscribers and Deliverability stats for the entire Auto Responder series, giving you more insight to subscriber activity and deliverability details. Next you will see each individual step in your Auto Responder and how it is performing including the number Sent, Opened, and Clicked. Below the Auto Responder Steps, you will be able to view all of your subscribers, along with their name, email, and the date they were added to the Auto Responder. You can also search your Subscribers by name or email at the top of the list. 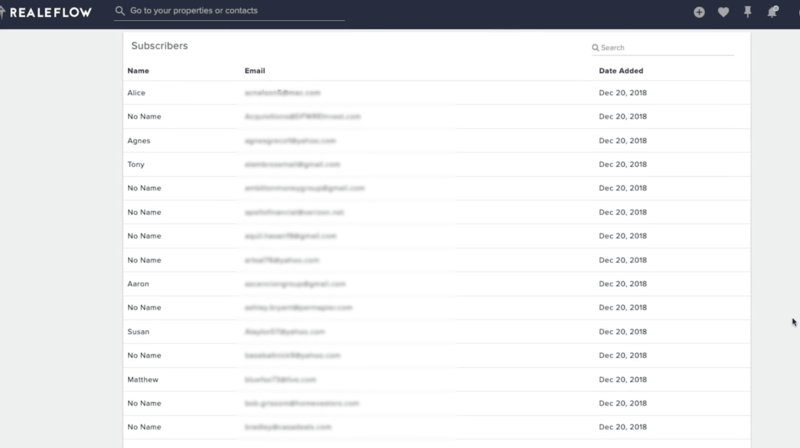 You can even see a list of who has unsubscribed from your Auto Responder, including their Name, Email, and Date Unsubscribed. The last item you will have access to in your Auto Responder Dashboard is a list of Bounced Emails including their Name, Email, and Date Unsubscribed. We hope you’ll take advantage of this new ability to view analytics for each of your campaigns and the ability to easily modify your Auto Responder Steps within this new dashboard. We’re going to be adding the same analytics to Email in the coming weeks as well. In our ongoing effort to streamline Realeflow and remove unnecessary steps from your daily processes, we have added an easily accessible way to see all of your notifications in one place. Previously, you would have had to go to each of the corresponding pages separately to see all of the Unread Notifications, Upcoming Tasks, and Unread Messages. The new Notification Tray increases visibility into all of these items by placing them in a central location, accessible from any page, by simply clicking the bell icon in the top right corner. 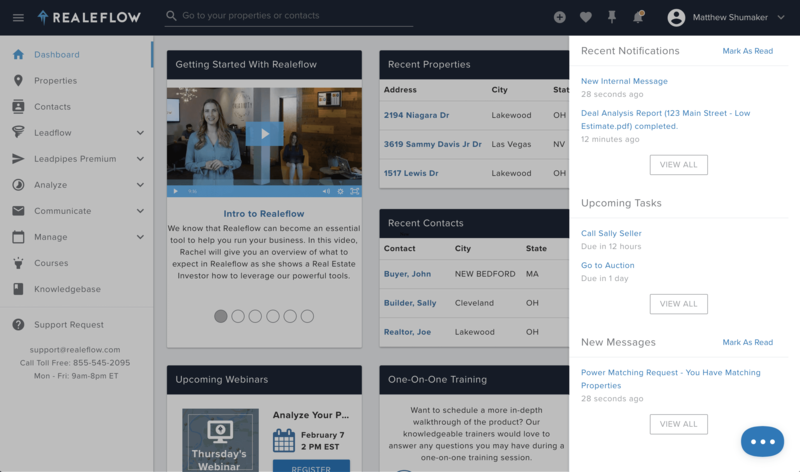 You’ll now have easy access to notifications like email campaigns sent, sms messages sent, reports generated, tasks due in the next 48 hours, and new internal messages. This is just the first of many daily user-engagement improvements to come. Our next update will help you prevent a problem that we’ve all experienced at one time or another. We always hear that a big part of building a successful business is being at the right place at the right time. Well, we’ve now added a feature that will ensure you at least have the right time for a designated place. We now have TimeZone Support for Realeflow's calendar. You can access this new setting by navigating to your Profile Page and choosing your Default Timezone. Then, when you go to to your calendar, you will see your selected timezone in the dropdown at the top of the page. You can then view your appointments in different timezones using this dropdown. You will also notice that the "All Day Event" checkbox is now unchecked by default, so you will be able to see the time icons right away. This update will also help fix any timezone issues that you may have been experiencing with syncing your Realeflow calendar to your Google Calendar or Outlook. Well, that’s it for this month. If you have any suggestions, comments, or features you would like to see implemented, contact us at brightideas@Realeflow.com. Click below to see these new features and the 30 other cool tools Realeflow offers! Start your 30 day FREE trial today!